Figure 1: a) Photograph of degraded resin due to small flight radii, and b) schematic of flight radii: the small flight radius (R1) would likely cause a Moffat eddy, and the large flight radius (R2) relative to the channel depth (H) would likely not form a Moffat eddy. Figure 2: Photographs of spiral Maddock mixers: a) mixer with very deep flutes and evidence of resin degradation, and b) a properly designed mixer where the depth of the flute is set at half of the width of the flute. Note: This is a version of the authors’ ANTEC® Indianapolis 2016 paper, specially abridged for Plastics Engineering. As of press time, the paper was scheduled to be delivered at ANTEC at 2:30 on Tuesday, May 24. New and innovative film products are constantly produced on pilot and manufacturing lines using either a cast or blown film process. Many times these films will be sent to end users for evaluation. Acceptable quality and properties of the films are keys to the success of the new film product. Most of the time the new film produced has acceptable quality (very low gels) and physical properties. Alternatively, the incumbent resin may be replaced with a challenger resin as a method to remove cost from the product. polymeric materials that are crosslinked via an oxidative process and appear as soft gels. For most cases, the incumbent resin has been running on the film line for extended periods of time, producing a product with an acceptable quality. Here the gel level would be relatively low, with only minor levels of black specks and brown soft gels. The gels would likely originate from regions of the screw that were stagnant, allowing the resin to degrade. When the challenger resin is fed to the extruder, slight differences in the processability of the resin relative to the incumbent resin will cause these degraded resin fragments to separate from the screw and contaminate the challenger extrudate. In many cases, the challenger resin receives the blame for the gels rather than the incumbent resin and poor screw design. The incumbent effect starts off by running a single-screw extruder for extended periods of time with the same resin (incumbent). Here the extrudate and film appear acceptable with only a few gels and black specks in the film product. These gels and black specs are generated in stagnant regions of the screw. The majority of the gels, however, are attached to the screw and are stable; i.e., not separating from the screw at a rate high enough to alarm quality specialists in the plant. Next, as a short trial or prototype run, the incumbent resin is switched with a challenger resin. Even though the challenger resin may be similar, it will likely process slightly different than the incumbent resin. 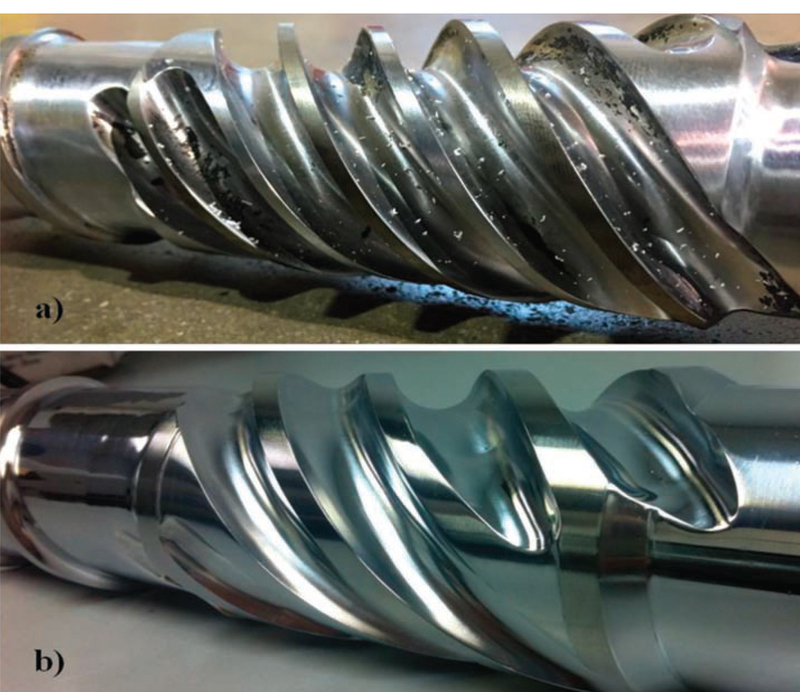 This slight difference in processing is often enough to cause the old degraded material that is adhering to the screw to separate from the screw and contaminate the extrudate. The old degradation will start to come out of the die typically in about five minutes after the switch for blown film lines. The initial discharge of gels is sometimes viewed as a gel shower, and then a high level of gels will continue to be observed for the short duration of the trial run. In many cases, plant personnel will unknowingly blame the high level of gels on the last change—in this case, the switch to the challenger resin. That is, the challenger resin is incorrectly blamed for the high level of gels. In severe cases, the trial is stopped and the challenger resin is eliminated as an acceptable resin for the application. The incumbent resin continues as the preferred resin. The root cause for the gels, however, is a poorly designed extruder screw and not the challenger resin. This is the incumbent resin effect. A necessary condition for the incumbent effect is minor design flaws in the screw. These flaws are regions where small amounts of resin stagnate, degrade, and then separate from the screw, causing defects in the film product. The level of gels is manageable at steady-state conditions for the incumbent resin. However, the slight upsets that occur by introducing a challenger resin can cause the degraded material to separate from the screw at a faster rate. If the challenger resin was processed for an extended period of time, likely the same level of gels would eventually occur. Typically, the challenger resin is extruded for only short trials, and is incorrectly blamed for the higher level of gels. The vast majority of screws operating in North America are single flighted designs with a barrier melting section and a downstream Maddock-style mixer. The most common flaws include flight radii in the metering channels that are too small, and improperly designed flutes on Maddock mixers.4 If the design of the screw is proper, the incumbent resin effect will not occur. The most common defect on screws built for PE resins is the size of the flight radii. Most screw manufacturers design screws with flight radii that are about half of the depth of the local channel. In many cases the size of the flight radii are even smaller. Figure 1b) shows the flight radius (left side radius) for an improperly designed screw for PE resins. Channels with small radii can cause regions where the residence time is extremely long, leading to resin degradation. A photograph of resin degradation due to small flight radii is shown in Figure 1a). The degradation at small flight radii are caused by long residence times due to the formation of secondary re-circulation flows known as Moffat eddies.5 Flight radii that are large, such as the radius shown on the right radius in Figure 1b), will not allow Moffat eddies to form, eliminating degradation at this location. As a general design rule, barrier flighted melting sections are best for screws with barrel diameters greater than 70 mm. If a barrier section is designed into smaller diameter screws, the advantages of higher melting rates are sometimes not obtained, and there is a high risk of the barrier section not functioning properly. For these small-diameter screws, the entry to the barrier section can become restrictive, limiting the specific rate of the extruder and causing resin degradation and gels.2,6 Although small-diameter screws can be designed successfully with barrier melting sections, the low-risk design would use just a simple single-flighted transition section. Maddock-style mixers7-9 are designed into most screws for PE extrusion processes. Their widespread use is due to their low cost to build, simplicity of the design, and their ability to trap, melt, and disperse solid polymer fragments from incomplete melting. They work by dividing the flow into two to eight different inflow flutes (depending on the diameter of the screw), passing the flow across a dispersive mixing flight, collecting the flow in the outflow flutes, and then recombining the flow for the downstream sections of the screw. Many innovations have occurred to the mixer since it was first described. One of the innovations was to increase the depth of the flute channels to mitigate pressure consumption and energy dissipation. If the flutes are made too deep, however, resin can become stagnte at the root and lead to resin degradation and gels. Photographs of two spiral Maddock mixer designs are shown in Figure 2. The mixer in Figure 2a) is poorly designed with the depth of the flutes being too large, creating flutes that will cause resin to stagnate and degrade. Degraded resin is observed in this mixer as black hard material. The mixer in Figure 2b) is much better, with the depth of the flute set at half the width of the flute. The incumbent resin effect, where degraded resin appears in the film product almost immediately after switching to a challenger resin, is created by two problems: 1) defects in the screw design that allow resin to stagnate and degrade, and 2) concluding that the challenger resin is the source of the degradation, even though not enough time has elapsed to create degradation gels from the challenger resin. There are two technical solutions to mitigate the incumbent effect for PE resins. The first and long-term solution is to design a new screw that does not contain regions where the resin flow will stagnate. This means that all channels must be filled and pressurized, flight radii must be large enough in the liquid-filled sections of the screw to eliminate Moffat eddies, and mixers must be streamlined such that stagnant regions do not exist. Designing and building a new screw will take six weeks or more for delivery. The new and properly designed screw will allow a nearly gel-free product. The second and short-term technical solution is to remove and clean the existing screw before the challenger resin is introduced to the extruder. For this solution, the extruder may operate without producing degradation products for several hours. After this induction period, the degradation products that are formed may be stable and attached to the screw, causing only a low and manageable level of gels. This gel level would be essentially equivalent to the level produced by the incumbent resin. Screws with the defects described in this paper will typically require very long times to have an acceptable purging. That is, the degraded materials at the flight radii or deep in the flutes of a Maddock mixer are difficult to remove using purge materials. Moreover, once the majority of the degradation is removed, the stagnant region is now filled with a combination of the purge material and the old degraded resin. If purge times seem excessive, it is recommended that the screw be removed and studied for degradation. For this procedure, the pellet flow to the hopper is stopped while screw rotation is continued. The screw is rotated until resin flow out of the die stops. Next, screw rotation is stopped and the transfer line is removed from the discharge end of the extruder. The hot screw should be pushed out about three diameters and then photographed and studied for indications of degradation. The metal surfaces should appear clean with only mild discoloration. If a stagnant region exits, then dark colored, degraded material will occupy the space. Once the segment is studied, the hot resin should be removed from the screw using brass tools. Another three diameters are then pushed out and the process is repeated. Poorly designed sections downstream from the screw can also cause resin to stagnate. These sections include poorly designed transfer lines, screen packs, and dies. The incumbent resin effect is described where a poorly designed screw for a single-screw extruder is operating stably with a manageable level of degradation gels in the PE film product. The degradation gels are formed in stagnant regions of the screw, but tend to stay adhered to the screw. When the extruder is switched to a challenger resin, slight process changes cause the degraded resin from the incumbent resin to separate from the screw, contaminating the film product. In many cases, the challenger resin is identified as the root cause of the problem rather than the poorly designed screw. 1. T.I. Butler, “Gel Troubleshooting,” in Film Extrusion Manual, Chapter 19, Edited by T.I. Butler, TAPPI Press, Atlanta, Georgia, 2005. 2. G.A. Campbell and M.A. Spalding, Analyzing and Troubleshooting Single-Screw Extruders, Hanser Publications, Munich, 2013. 3. M.A. Spalding, E. Garcia-Meitin, S.L. Kodjie, and G.A. Campbell, SPE ANTEC Tech. Papers, 59, 1205 (2013). 4. M.A. Spalding, Plast. Eng., 71 (9), 32 (2015). 5. H.K. Moffat, J. Fluid Mech. 18, 1 (1964). 6. K.S. Hyun, M.A. Spalding, and J. Powers, SPE ANTEC Tech. Papers, 41, 293 (1995). 7. G. LeRoy, US Patent 3,486,192 (1969). 8. R.B. Gregory, U.S. Patent 3,788,614 (1974). 9. P. Andersen, C-K Shih, M.A. Spalding, M.D. Wetzel, and T.W. Womer, SPE ANTEC Tech. Papers, 55, 668 (2009).